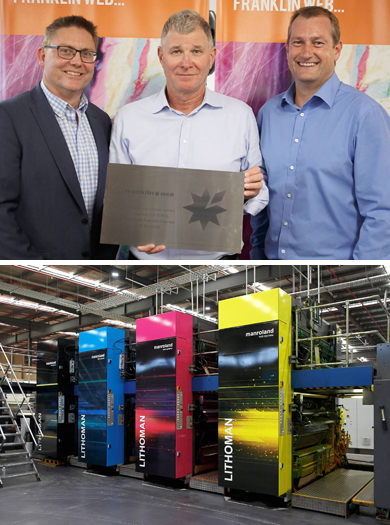 Two 80-page manroland Lithoman presses underpin production at the site in Huntingwood, in Sydney's west, at which fewer that 20 people are typically onsite at any one time. Production commenced last October and has since been doubled with the commissioning of the second press. Additionally, postpress equipment includes Gammerler trimming and Rima log stackers - capable of handling 120 tonnes combined of printed product a day - plus Müller Martini saddlestitching and inserting and a Corona perfect binder. Prepress and production management is at Franklin in Melbourne's Sunshine, the original catalogue supersite finessed by (now retired) Phil Taylor which was the inspiration for Huntingwood. Ive Group managing director Warwick Hay says Franklin is "the cornerstone" of the group's expansion into the catalogue market: "Ive has invested $50 million building the new production facility to support our customers as catalogues are proven to be Australia's most effective media channel."